While time travel is merely a figment of the imagination, Sacred Leathers brand of steely, raucous and pure metalstraight out of 1983, is not. Brandishing leather and chains, rafter-reaching vocals and scorching solos, Sacred Leather represent heavy metal in its truest form on their first full-length album and debut Cruz Del Sur Music release, "Ultimate Force".The product of five metal banshees from the midwestern portion of the United States, Sacred Leather has spent the better part of their existence fine-tuning their live presentation while releasing a series of singles and splits in preparation for "Ultimate Force". Written over the course of two years, "Ultimate Force" was recorded during the fall of 2017 at Earth Analog Studios in Tolono, Illinois, with additional sessions taking place at Beware Sounds and Clandestine Arts Recording in Indianapolis, Indiana. Mixing and mastering was handled by Sacred Leather lead guitarist Carloff Blitz at Clandestine Arts Recording shortly thereafter.The result is a fierce blend of classic and thrash metal, fully capable of unleashing an all-out blitz ("Ultimate Force","Master Is Calling"), dealing mid-tempo bashers ("Watcher", "Power Thrust") and perhaps best of all, offering anepic, towering ballad in the form of "Dream Searcher", which, according to lead vocalist Dee Wrathchild, is the mostambitious track on the record. "Its centered around the theme of heartbreak. A man has lost his love and is onlyable to be reunited with her in his dreams. He is poised to suffer eternally in reality, but in the realm of sleep, he isable to revisit her." While time travel is merely a figment of the imagination, Sacred Leathers brand of steely, raucous and pure metalstraight out of 1983, is not. 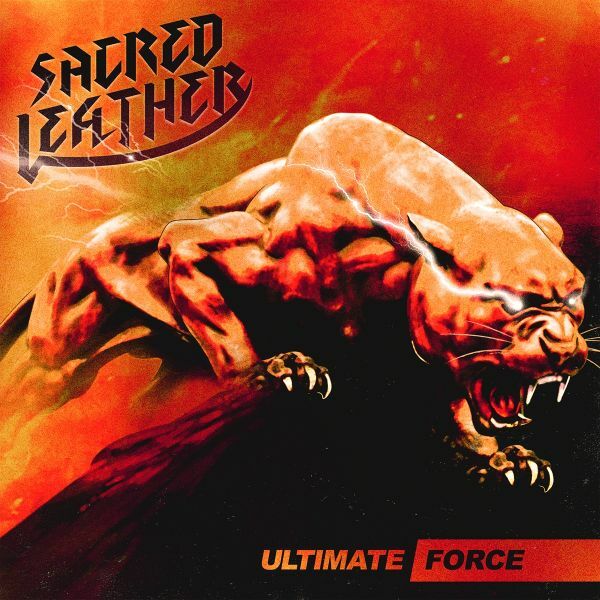 Brandishing leather and chains, rafter-reaching vocals and scorching solos, SacredLeather represent heavy metal in its truest form on their first full-length album and debut Cruz Del Sur Music release, "Ultimate Force".The product of five metal banshees from the midwestern portion of the United States, Sacred Leather has spent the better part of their existence fine-tuning their live presentation while releasing a series of singles and splits in preparation for "Ultimate Force". Written over the course of two years, "Ultimate Force" was recorded during the fall of 2017 at Earth Analog Studios in Tolono, Illinois, with additional sessions taking place at Beware Sounds and Clandestine Arts Recording in Indianapolis, Indiana. Mixing and mastering was handled by Sacred Leather lead guitarist Carloff Blitz at Clandestine Arts Recording shortly thereafter. The result is a fierce blend of classic and thrash metal, fully capable of unleashing an all-out blitz ("Ultimate Force", "Master Is Calling"), dealing mid-tempo bashers ("Watcher", "Power Thrust") and perhaps best of all, offering an epic, towering ballad in the form of "Dream Searcher", which, according to lead vocalist Dee Wrathchild, is the most ambitious track on the record. "Its centered around the theme of heartbreak. A man has lost his love and is onlyable to be reunited with her in his dreams. He is poised to suffer eternally in reality, but in the realm of sleep, he isable to revisit her."